Wendy Lamb Books-Random House, September 9, 2014. Naomi’s great love of the birds on her native Cape Cod has earned her the nickname Chirp. She loves to go to her special spot near the pond to watch them swim and fly, taking in every detail of how they look and how they move. Chirp also loves to dance with her mother, a professional dancer. Now that Mom’s leg is hurting her and she can’t dance, Chirp convinces her sister Rachel to put on a show in hopes of cheering her up. But Mom’s achy leg is the sign of a much bigger problem and the start of a very long year for Chirp and her family. Chirp will need to gather a lot of strength from her birds and her budding friendship with her neighbor just to make it through. Nest is beautifully written, a marvelous debut. Erlich has a wonderful very true sense of the thoughts and actions of the 11-year-olds, teenagers, and even the adults in the story. She manages to convey their difficult and confusing feelings beautifully and believably throughout the book. Chirp’s relationship with Joey is especially rich as they each muddle through their troubled lives. I loved the flow of the relationships in the story—the way each character sometimes did just the right thing or, at other times, exactly the wrong thing, making the story messy in precisely the way real life is. As much as I enjoyed this story, I read it with caution sirens blaring in my head. The lovely cover gives no hint of the emotional weight of the story, and the first words, too, seem to be drawing the reader into a nature story. As an avid reader and a very sensitive child, this book’s events and characters would surely have brought on a stomachache and a spate of anxiety dreams for me. I worry a bit, too, about readers who find parallels in their lives to the lives of these characters. Though there are reasons within the story to find hope, there are also reasons child readers might find fear. 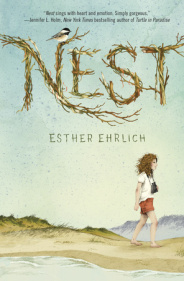 So, adults, I would suggest you do read Nest and take in Chirp’s story. Do recommend it, but think carefully about individual readers and recommend Nest with care. I read an electronic advanced reader copy of Nest complements of Random House and NetGalley.